Wild turkeys exist throughout Vermont today, but that wasn’t always the case. Wild turkeys disappeared from Vermont in the mid-to-late 1800s due to habitat destruction when land was cleared for farming and only 25 percent of the state was covered by forest. The wild turkeys we see in Vermont today originated from just 31 wild turkeys stocked in Rutland County by the Vermont Fish & Wildlife Department in 1969 and 1970. 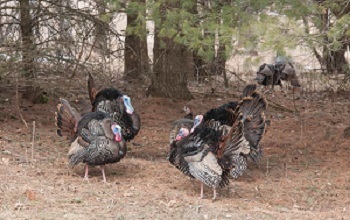 Vermont’s forest habitat was once again capable of supporting turkeys. State wildlife biologists moved groups of these birds northward, and today Vermont’s population of turkeys is estimated at close to 50,000. This is just one of many wildlife restoration success stories we can be thankful for in 2018. Funding for Vermont’s wild turkey restoration was derived from the sale of hunting licenses and a federal tax on hunting equipment.